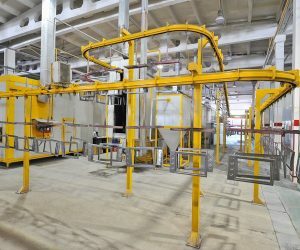 Overhead conveyors are a continuous loop of chain or cable that is suspended from a formed or structural track with carriers attached periodically to hang or contain products. 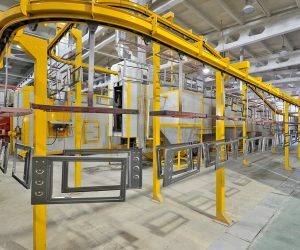 They are frequently used in automated or semi-automated painting systems for moving product through the cleaning, painting and drying operations. They can handle odd shaped parts that are difficult to convey on belt and roller type conveyors.